We recently posted an update commemorating one year of Enterprise Grid, which highlighted the 150-plus customers using Slack’s product for large, complex companies, including global brands like IBM, Condé Nast, Target, and Capital One. But now we’d like to talk a bit more about how Enterprise Grid powers the work of some of the world’s largest organizations. When we talk about scale, we aren’t just talking about building a product that supports up to 500,000 users (which it does). 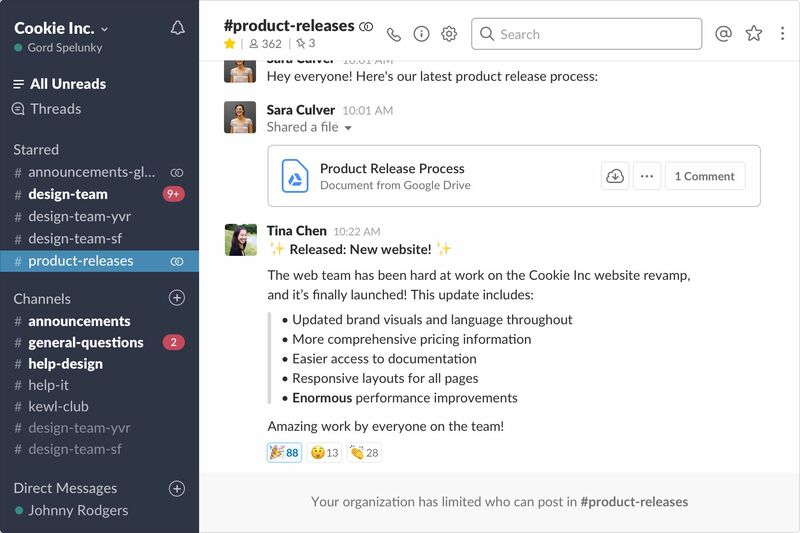 Rather, deploying Slack to hundreds of thousands of people requires tools that enable users to get work done in focused workspaces, while providing administrators with centralized oversight and management. Make and discover important announcements by creating default channels, which automatically include everyone in your company (with the option to make membership required). Given the size and impact of these channels, only admins can create them and posting permissions are limited to certain people, such as executives or internal communications managers. Plus, admins have the ability to turn on emoji reactions and threading for messages if desired. We’ve added a new “Apps” page to the Admin Dashboard that provides insight into which apps are being used across all workspaces in your organization. 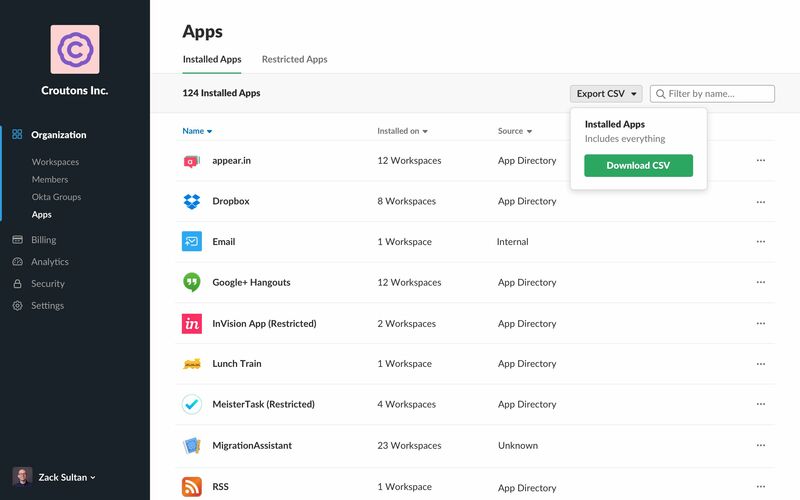 For each app, Org Admins can view the workspace(s) it’s on, who installed it, and whether it was installed from the App Directory. We’re also working on adding new tools to help admins streamline app management by defining rules to automatically approve (or reject) apps based on their level of requested scopes. We’ve updated the onboarding experience to help new users find relevant workspaces in Slack while reducing administrative overhead. Now, new users who aren’t already assigned to a workspace can find workspaces by entering the names of people they work closely with. Additionally, we’re adding the ability to customize onboarding to insert guidance or relevant links specific to how your company uses Slack. Enterprise organizations don’t have to compromise between the products they need to be productive and meeting security or compliance requirements. We’re continuously investing in new tools and certifications that help enterprise admins enable their teams to work how they want and need to in Slack, even if that work contains sensitive information or you’re in a regulated industry. If your organization has specific policies for using Slack, Org Admins can create a Custom Terms of Service that everyone in their organization (and optionally guest accounts) must accept in order to sign in. Admins can proactively monitor or reactively audit events that occur within your enterprise using our Audit Log API that surfaces 30-plus critical events including file downloads, login activity, and workspace permission changes. Additionally, you can pipe the API into monitoring tools such as Splunk or Sumo Logic to look for abnormalities or combine Slack data with that from other sources. We’re continuing to invest in controls that help ensure only the right people have access to your organization’s information. 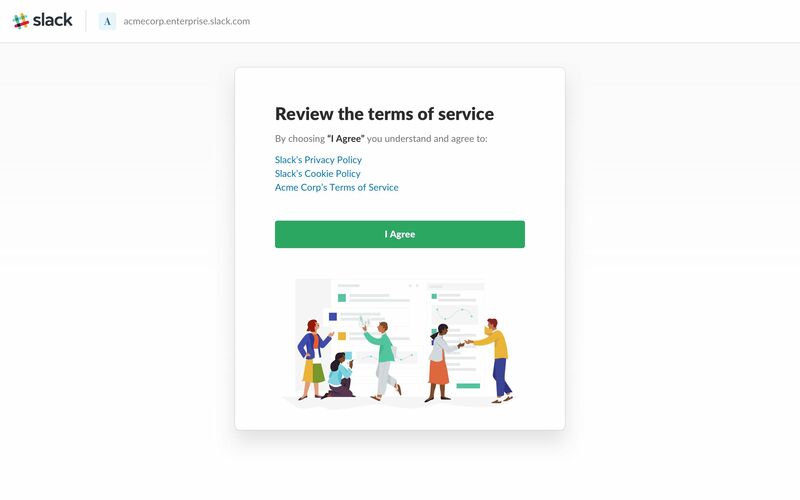 Building off support for Enterprise Mobility Management (EMM) we announced last summer, admins can now restrict the ability to copy text or links from either of Slack’s mobile applications. We are also investigating other device-level security controls such as app-specific passcodes and force logout on specific devices. We’re continually evolving our security offering and adding new third-party certifications to mirror our growing customer base. For those of you who operate in Europe, Slack is GDPR compliant. Additionally, we recently received certifications for ISO 27001 and 27018. You can learn more about Enterprise Grid here, or write in to our team at accounts@slack.com.